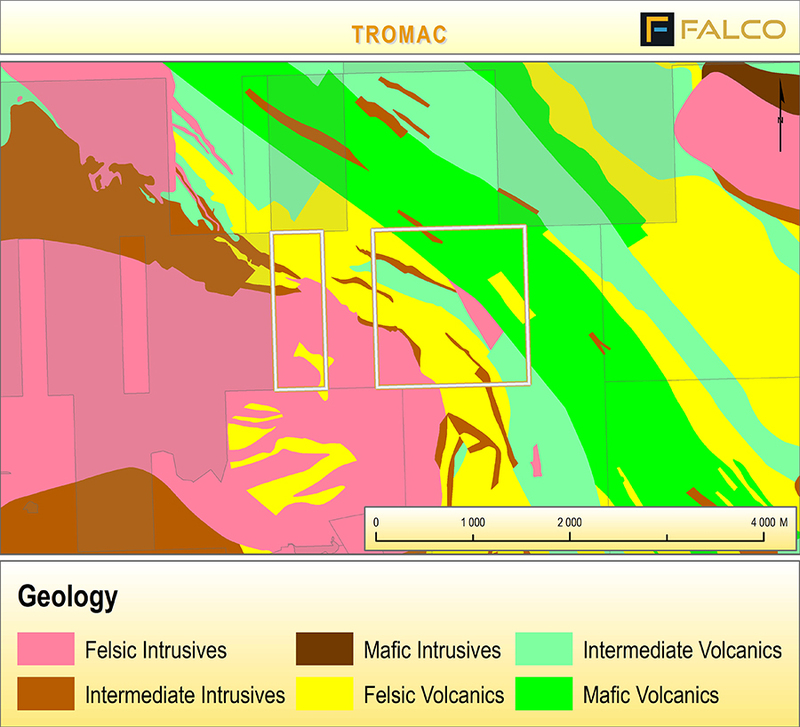 The Tromac property is underlain by a bimodal volcanic sequence striking South East in contact with porphyritic phases of the Lac Dufault granodiorite to the south west. At least three north east striking faults cross cut this contact and the volcanic sequence at a more or less perpendicular angle. Late felsic porphyritic and dioritic dykes are intruded in the sequence. The only known showing on the property consists of a series of small quartz-pyrite veins with high gold grades that were intersected by drilling in the 1940’s. They are located in the granodiorite at about 20 to 55 metres from the contact with the rhyolite to the north. They seem to strike to the south east with a gentle dip to the north east. The stacking of these high grade veins could form a wide low grade envelope. The surface samples grabbed by Falco during the summer of 2014 located several zones of quartz-pyrite veining in the granodiorite a bit south west of the historical drill hole intersections. 9 samples assayed over 100 ppb with 2 of them assaying 25.9 and 20.7 g/t Au. From 1945 to 2007, several exploration surveys were carried out on the property including mapping, geochemical sampling, airborne and ground geophysics as well as 62 diamond drill holes. Note that 54 of these holes were drilled prior to 1947, uncovering a gold bearing quartz vein system not explored since. In 2014, Falco carried out a surface sampling survey to locate the surface extension of the mineralisation found in the 1940’s. The Tromac property is a Greenfield exploration project and consists of 8 claims covering an area of 335 ha. It is 100% owned by Falco Resources. The Tromac property is located in Dufresnoy Township, about 12 km North East of the city of Rouyn-Noranda. All rights reserved &COPY; 2019 Falco Resources.